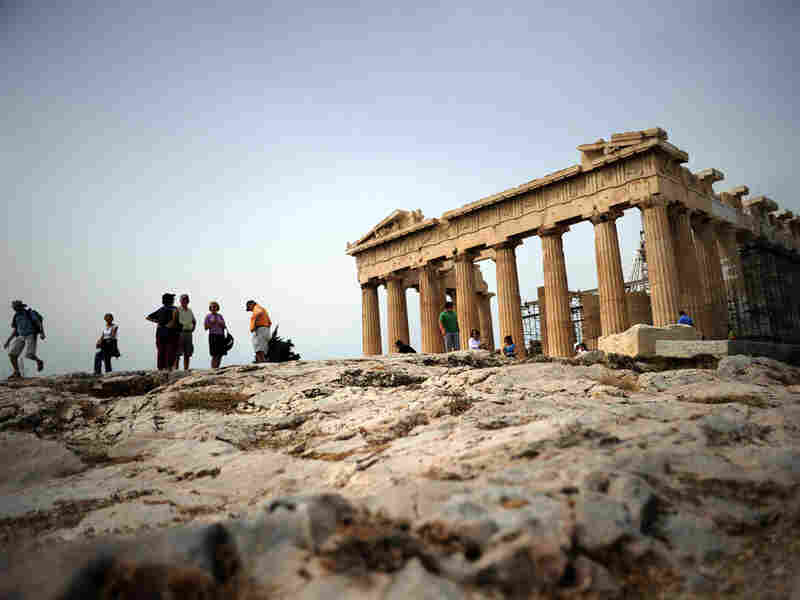 Vacationers Rethink Greece Amid Debt Crisis One of Greece's best hopes for dragging itself out of debt is the tourism industry, which employs about one-fifth of the Greek workforce. But media coverage of the Greek economic meltdown and the sometimes violent anti-austerity protests are threatening to keep tourists away. Greece is trying to drag itself out of debt, while at the same time imposing an austerity program that is limiting growth. One of the country's best hopes for overcoming this paradox is the tourism industry, which employs about one-fifth of the Greek workforce and accounts for up to 18 percent of gross domestic product. But media coverage of the Greek economic meltdown and the sometimes violent anti-austerity protests are threatening to keep tourists away. In yet another blow last week, Moody's Investors Service slashed the country's credit rating to junk status. "Enjoy your time in Greece, your holiday," he tells them. "Explore your senses." "Explore your senses" is the slogan from the glory days of 2007, when Greece spent 40 million euros (nearly $49 million) on a tourism campaign. Three years later, the country is broke. It owes more than 300 billion euros and narrowly avoided defaulting on its debt last month when the International Monetary Fund and the European Union gave the country 110 billion euros in loans. Some parts of the country -- such as Crete and Rhodes -- have been hit especially hard. Tourism is the one sector where Greece can regain, most easily, most quickly, competitiveness. You don't do that by preventing people from coming to Athens or visiting the country and sending out a message that you're not welcome. Kelaiditis' clients called him, worried about the violent scenes they saw on TV. "The reality is not exactly like that," he says. "We just decided to go ahead and give it a shot, and it's all worked out great," she says. "Tourism is the one sector where Greece can regain, most easily, most quickly, competitiveness. You don't do that by preventing people from coming to Athens or visiting the country and sending out a message that you're not welcome," Bastian says. Germans usually make up about 15 percent of visitors to Greece. But the Association of Greek Tourism Enterprises estimates that 300,000 of them -- or about 12 percent of the Germans who come to Greece annually -- will stay away this year. About 16 million travelers visit Greece each year. So Greece's tourism ministry is trying to restore the country's image in Germany and beyond. These scenes are supposed to remind tourists that Greece hasn't changed, says Giorgos Alimonos of the Greek National Tourism Organization. "We don't see tourists as clients. We [treat them as if we are] welcoming people into our family. So I think that beside what happened -- which was very limited and very isolated -- for Greece, tourism is business as usual," Alimonos says. "It's a little bit like coming home. And they are so friendly and treat us so kindly, and it was a special Greek family atmosphere, and that's what we love," he says. "These days, a foreigner sees a crazed Greek, caught up in madness. He should be seeing a happy Greek who is smiling -- but genuinely smiling," Kapetanakis says. "In the old days, we knew how to take care of the people who visited us through a genuine and warm hospitality that defined Greeks," he says. "In the old days, we were very good at taking care of ourselves, too."